Our PVC Installation Services Give You a Quality, Long Lasting Roofing System That Protects Your Building. If you own a sloped roofing system or fixed roofing system on your office building, when you are needing to build a new roofing system, PVC roof installation is a great option. PVC roofing is an amazing roofing system that is very resilient, providing security for office structures, and the individuals inside, with its high-quality material. Our licensed roofers have been installing PVC roofs to commercial structures for decades, so they have the skills and knowledge to assemble this superior roof on your office structure. 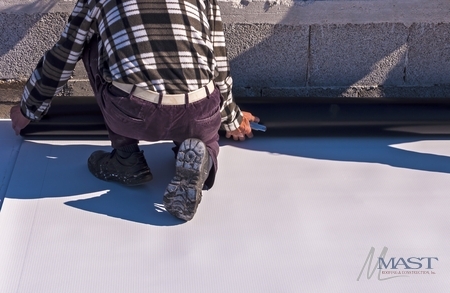 You can continually feel protected and shielded knowing that the roofing contractors at Mast Roofing and Construction, Inc. are here to introduce exceptional PVC roof installations to our office clients. To get an affordable PVC roof installation in Oley and Philadelphia, PA every time, all you need to do is call the roofers at Mast Roofing and Construction, Inc. now at 610-689-3737 to set up a consultation with one of our professional roofers. The eminently prominent feature of a PVC roof is how resilient it is, but commercial structures can also profit from several other first-rate PVC roofing features. Impervious Roof Material: You know that you are utterly secure from flames and strong winds with a PVC roofing system that is resistant to flames and wind. Better Heating and Cooling Efficiency: A nice approach to guarantee that you have decreased costs on your utility fees is to install an energy eco-effective roof like PVC. Have More Years Out of This Roofing System: Having a roof that lasts for years is important and a PVC roofing system has a lifespan of 20 years, so you can have years of robust protection. Inexpensive Installation: A huge advantage to office building proprietors who are curious about PVC roofing is that the expense of the product and assembling is really affordable as opposed to other roofing systems out there. Contact our roofers today at 610-689-3737 to learn more about the benefits of PVC roofing, or to set up a consultation to install a PVC roof in Oley and Philadelphia, PA.
Our roofing company is the authority in PVC roof installations and committed to greater client happiness with our professional roofing services in Oley and Philadelphia, PA. We have consistently made it our mission to use the strongest products, equipment, and employ certified and skilled roofing contractors in order to provide our customers with superior roofing services. Let our roofers transform your building roofing system into a greater protecting system with our exceptional PVC roofing assembling. When you are looking for the best PVC roofing installation in Oley and Philadelphia, PA, call the amazing roofers at Mast Roofing and Construction, Inc. now at 610-689-3737; we are here to get your roof looking and functioning greater than before.